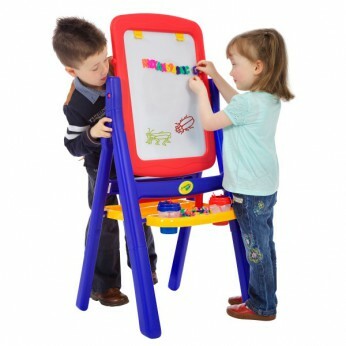 4-in-1 easel including a magnetic board, a whiteboard, a chalkboard and a painting surface. Easel “quickflips” 360 degrees for a variety of drawing and painting projects. Folds flat for compact storage. Includes 77 magnetic letters and numbers, 2 paint pots and an eraser. Brushes and pens not included. Colours and styles may vary. Dimensions: 48Lx51Wx104Hcm…. This toy costs approximately £27.99 (for the latest and best prices make sure you check our retailer list for the Crayola Quickflip 2 Sided Easel above). In our review of Crayola Quickflip 2 Sided Easel we classed it as being suitable for ages 1 to 3 years but recommend you check the manufacturer specific advice before purchasing.